RDA — One more 3 letter word! We are interested in knowing what results you believe to be most important. How would you know if a local early intervention services program or a school was successful in educating children with disabilities? OSEP provides oversight of States' while States provide oversight of IDEA implementation for local early intervention services programs and school districts. How can OSEP work with States to impact improved educational results and functional outcomes for infants, toddlers, children and youth, while continuing to ensure that States properly implement IDEA requirements? As OSEO refocuses its accountability efforts, which IDEA requirements do you see as being most closely related to improved educational results and functional outcomes for infants, toddlers, children and youth with disabilities? OSEP asked the National Center on Educational Outcomes (NCEO) to work with a small group of stakeholders and assessment experts to provide input on measures that could be used to review states' performance results of their students with disabilities who receive special education services. The group's recommendations are contained in a report, Using Assessment Data as Part of a Results-Driven Accountability System: Input from the NCEO Core Team (PDF) with samples contained in the companion report: Sample Approaches for Using Assessment Data as Part of a Results-Driven Accountability System (PDF). What is your feedback on these reports? What other data sources may be useful as we move forward in the development of a RDA system? OSEP worked internally to develop a set of Core Principles to guide its RDA work. Do you have any comments or input on these RDA Core Principles? CASE let you know about these questions and encouraged you to answer them. We have also had several articles about RDA in our In CASE quarterly newsletter and I have mentioned it several times in the weekly updates. 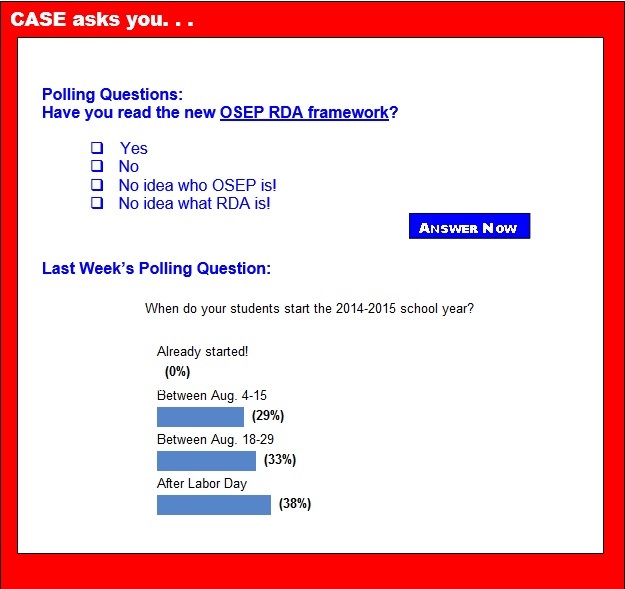 Since these questions were asked, OSEP has developed a website dedicated to RDA and resources. Have you been to this site before? Are you aware of what steps your state department is taking to comply with RDA? How can CASE assist you in the preparation for RDA? We would love to hear your ideas or experiences so far on RDA — comment on our facebook page or email our Policy and Legislative chair, Phyllis Wolfram (MO) or me. Speaking of Results ... Have you seen the most recent determination by states from OSEP? Click here to go to OSEP's State Performance Plan and Annual Performance Report Forms, and Supporting Documents page and look at the maps on meeting compliance only as well as the maps on meeting educational outcomes for students with disabilities. The data speaks to why RDA is such a big deal. Please let us hear from you on what is happening in your state. So, you can see CASE is working for you! Are you a member of CASE? If not, now is the perfect time for you to join with the new tiered options from CEC! CASE and CEC take you to the next level — remember what great resources CASE provides to you in the leadership area and CEC provides for your teachers! CEC has made membership easier for all educators through the new tiered membership. Click here for the chart that outlines the membership benefits and cost at each level. Then head on over to the CEC website. But don't forget, to also add at least CASE as one of your divisions! If you have questions, contact me or our membership chair, Steve Milliken (NE). Between 3 and 6 percent of schoolchildren suffer from an arithmetic-related learning disability. Researchers at Ludwig-Maximilians-Universitaet in Munich now show that these children are also more likely to exhibit deficits in reading and spelling than had been previously suspected. Addition and subtraction, multiplication and division are the four basic operations in arithmetic. But for some children, learning these fundamental skills is particularly challenging. Studies show that they have problems grasping the concepts of number, magnitude, and quantity, and that they do poorly when asked to estimate relative amounts. On a morning in late May, the pace was slow and deliberate as seven students formed a semicircle around their teacher to work on a lesson about finding the main idea in a story. "I have a surprise for you on my phone," said Nicole Papa, before starting an audio recording of "Smart-Speak," a nonfiction article about bullying and peer pressure. Pencils in hand, the third- and fourth-grade students followed along with the recorded voice. "Now, let's read it again, just a little bit closer, and think about the main idea, or gist, of each section," said Papa, reading the first section aloud. "What's it mostly about?" For young children with disabilities, the key to mastering language may be surrounding them with their typically-developing peers, researchers say. Over the course of just one school year, a new study finds that preschoolers with disabilities who attended mainstream classes with highly-skilled peers were using language on par with their classmates without disabilities. By comparison, kids with special needs who were surrounded by children with weak language skills remained far behind their typically-developing peers at the end of the school year. The backlash against the Common Core has prompted lawmakers in at least 12 states to get more involved in setting their own K-12 academic standards, injecting politics into a process usually conducted in obscurity by bureaucrats. In several states, legislators have placed new restrictions on state boards of education, which typically write and update academic standards. In others, lawmakers have opened up the development of standards to greater scrutiny, requiring that proposals receive public vetting. And in Oklahoma, which has embarked on an extreme makeover of its standards process, lawmakers passed a law that lets them rewrite any standards they don't like. When the final Common Core State Standards were released in 2010, they were notable, in part, for how little opposition they generated. After prior attempts to create uniform national standards had failed, that goal seemed to have finally been accomplished, and in a way that was bipartisan. Kentucky was the first state to sign on, and two months after the standards were released, more than two-thirds of states had adopted the standards. With few exceptions, educators hailed them as a big improvement for most states, a chance to give some uniformity to education expectations across the United States and ensure that students graduate from high school with a deeper understanding of subjects, better critical thinking skills and thorough preparation for college courses. Educators like to say that third grade is the year when students go from "learning to read" to "reading to learn." Yet one afternoon last month, there was Anthony, a 10-year-old whose small frame was highlighted by baggy black cargo shorts, struggling with "Tiny the Snow Dog," a picture book with only a handful of words per page. "This is Tiny," he read to his teacher, Holly Bryant. "He is my dog." The guiding philosophy for educating children with disabilities has been to integrate them as much as possible into a normal classroom environment, with the hope that peers' skills will help bring them up to speed. A new study provides empirical evidence that peers really can have an impact on a child's language abilities, for better or worse. While peers with strong language skills can help boost their classmates' abilities, being surrounded by peers with weak skills may hinder kids' language development. The findings are published in Psychological Science, a journal of the Association for Psychological Science. While educators teach math, reading and social studies during the school year, anti-bullying policies and lessons have also catapulted to the top of curricula in every school in Florida. In 2008, Florida passed the "Jeffrey Johnston Stand Up for All Students Act" to prohibit the bullying or harassment of a student or employee of a public K-12 education institution in the state. Broward County was the first to implement the policy. Several years later, schools are putting a major emphasis on bullying prevention to make sure students and teachers feel safe and protected. Do soundtracks improve reading comprehension? A platform that pairs e-books with movie-style soundtracks is gaining attention in the K-12 realm for boosting reading engagement and comprehension. But some researchers remain skeptical of its claim of increasing achievement without additional instruction. Booktrack Classroom is a free online program that allows students to create synchronized soundtracks for any kind of digital text. For example, a student can read a Sherlock Holmes e-book that opens with a background, classical piano score that transitions into birds chirping, a fire crackling and other sounds as the characters move through the action of the story. Trina is an eighth-grader trapped in her own prison. She has every excuse in the book and is often referred to as just unmotivated. But I don't buy that story. Not at all. To a five-year-old, learning is exciting. While some are academic naturals, others lag. Well-meaning educators intervene, and praise, rewards, and external incentives surface. Thus, we can see the sixth component of reading — motivation. But what of the adolescents who deflect their inability to keep up by throwing a pencil when you aren't looking, or by bullying others? Enter the "unmotivated" adolescent. The guiding philosophy for educating children with disabilities has been to integrate them as much as possible into a normal classroom environment, with the hope that peers' skills will help bring them up to speed.